Topics: Landlord Insurance, Unoccupied Property, Overseas Property, Rent Guarantee, Eviction Of Squatters, and Tenants Contents. The site has about 257 users daily, viewing on average 3.60 pages each. It is written for PHP/5.2.17 language. 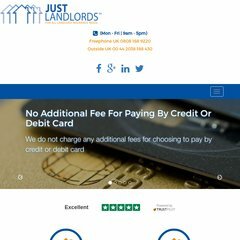 Its 2 nameservers are ns2.justlandlords.co.uk, and ns1.justlandlords.co.uk. It is hosted by Compuweb Communications Services Limited (England, Nottingham,) using Apache web server. PING (91.215.186.9) 56(84) bytes of data.